Tail/Wings: Tail hangs freely about a foot and a half long. Wings have a span of 40 feet and are white as well. Physique: He is stocky but skinny. He stands at 5 feet and 6.5 feet long. He has massive wings. Residence: 2 story house on the outskirts of Ponyville. Occupation: He makes a living from selling woodwork and custom furniture and doesn't get much business even from advertisement. He works at home and spends some of his free time at the park or behind a desk coming up with some new invention. Almost always at home unless his family or friends drag him somewhere. Unique Traits: He has been able to learn about and how to perform magic and often visits ponies to learn more. He knows how to summon weapons made from solid light, how to summon a bubble shield that is about the strength of titanium, teleport, and various small spells. Knows how to make a few potions. History: His birthplace is unknown, but was raised by wolves in the Everfree forest. He ran away at the age of 12 (84 Dog years) and ended up in Ponyville where he was adopted by Aqua Sunlight (a female Unicorn) and Shadow Mark ( a male Pegasus) and their son Monstone Blue (a male Pegasus). Wolf then when to school for 6 years with his brother and was bullied often at school. During those 6 years, he has also learned how to speak English and he can also write with his paw. For the past 6 years (42 Dog years) Wolf has been almost on a complete pony diet (without meat), but still has a meat crave and sometimes goes hunt mode after eating even a sliver of meat. Wolf has never hurt anypony physically, or emotionally. At the age of 13, he found out that he had magical abilities and was taught by his mother about magic and knows some spells. He was taught by his father how to fly. He was also taught by his little brother how to stand up for himself. He found out that he could shapeshift when he was 16 years old (112 Dog years). He lives in Ponyville, he visits his family often. 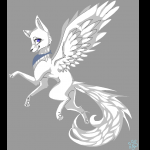 He has a pony form and will occasionally change into a gray stallion, a black and red mane and tail, and has a white wolf on his flank. Character Personality: He is caring, kindhearted, loving and willing to make new friends, adventurous, playful, energetic, enthusiastic, sarcastic at times, intelligent, and knowledgeable. At home most of the time, unless he is getting dragged by friends and family, or getting food. Not very chatty and not one to strike up a conversation. Character Summary: Wolf is a kindhearted creature that would put others first and help anypony in need. He is driven by the thirst for knowledge. Home alone mostly and is not very known around. He is always doing something when not alseep.